An artist’s rendition of a 3D skyrmion. There’s an eerie and incredibly rare phenomenon witnessed by few that has long puzzled scientists: ball lightning. These flashes, which typically appear in the evenings during thunderstorms and look like small, bright spheres, have gone mostly unexplained aside from some theories. 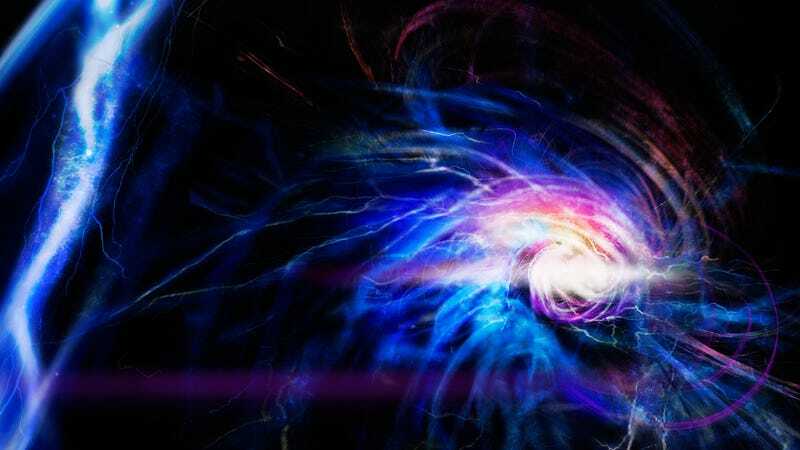 But now, using some of the most mind-bending physics around, physicists think that they’ve recreated ball lightning, in miniature, in the lab, while at the same time observing a different physical phenomenon in its own right for the first time. What the scientists created is called the Shankar skyrmion, a three-dimensional, tangled, closed, synthetic magnetic field formed in a Bose-Einstein condensate. Bose-Einstein condensates are systems of atoms—in this case, rubidium atoms—near absolute zero. They’re able to demonstrate strange quantum effects on macroscopic scales, and they allow researchers to create otherwise impossible-to-study phenomena, like magnets with only one pole, supersolids, Rydberg polarons, and in this case, strange, knotted magnetic fields. And the authors, whose work appears today in Science Advances, are absolutely sure about what they’ve spotted. To conduct this experiment, the scientists took advantage of the fact that particles have an innate property called spin, which makes them kind of like the smallest possible bar magnets. By applying an external magnetic field on a Bose-Einstein condensate, the researchers could arrange each of the rubidium atoms’ spins in a special configuration, so that they all face the same way along the surface of a ball, but twist in a peculiar way inside the ball. There are multiple possible configurations of the skyrmion allowed, so long as they follow two rules: Each magnetic field line is a circle and linked with every other line once, and if you follow circular paths that maintain the same spin direction inside of the skyrmion, the atom will twist twice. The magnetic field lines of the skyrmion. Basically, think of a magnetic field as a list of instructions at every point in space of where a magnetic thing will go, and an electric field as a similar list of where a charged particle will go. The skyrmion isn’t an intrinsic magnetic field, but a synthetic one based on the arrangement of the rubidium atoms that would take any particle on a twisted journey. It has an equally tangled electric field, and the particles clump to form complex structures in the gas. The shadow of the skyrmion, demonstrating the complex structure of the particles clumping in three different spin states. The top row shows what the team expected to see based on theory, and the bottom shows what they actually saw. Other scientists I spoke with were impressed by the research. “It takes a lot of really incredible experimental engineering to be able to create these things,” said Azure Hansen, postdoctoral researcher at the National Institute for Standards and Technology. She was struck by the impressive match between theory and their observations. Bose-Einstein condensates are nearly macroscopic, and these systems expand from tens of micrometers to a hundred micrometers on each side. The scientists took pictures of the skyrmion’s shadows to confirm that it existed. More research on skyrmions could prove useful for other reasons than just modeling ball lightning, Hansen said. Since you can have lots of different skyrmion configurations so long as they obey the same rules, they’re topological objects. Topological objects are things that could morph into each other through squishing or stretching, while still retaining certain innate properties. Donuts and coffee mugs, for example, are the same topological object in that, if they were both made from clay, you could smush one form into the other and preserve the hole in the center. Because skyrmions stay skyrmions even when you squish and deform them, they could be useful for things like quantum computing, which requires maintaining a coherent quantum state despite jostling from the outside environment.